To the world she was Agatha Christie, legendary author of bestselling whodunits. But in the 1930s she wore a different hat, travelling with her husband, renowned archaeologist Max Mallowan, as he investigated the buried ruins and ancient wonders of Syria and Iraq. When friends asked what this strange 'other life' was like, she decided to answer their questions by writing down her adventures in this eye-opening book. 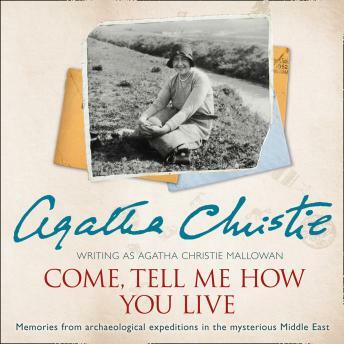 Described by the author as a 'meandering chronicle of life on an archaeological dig', Come, Tell Me How You Live is Agatha Christie's very personal memoir of her time spent in this breathtaking corner of the globe, living among the working men in tents in the desert where recorded human history began. Acclaimed as 'a pure pleasure to read', it is an altogether remarkable and increasingly poignant narrative, a fascinating, vibrant and vivid portrait of everyday life in a world now long since vanished.